Hi ... we recently returned from a week in Ohio, visiting hubs family. We had a great time. Returning home it was time to pay the piper and get caught up with the work waiting for us. 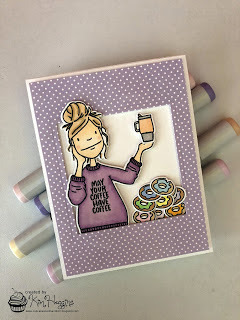 I am rushing through to get this entry for Color Throwdown #503 posted before the linky slams the door! I love those colors, they really grabbed my attention. A new set of dies (gift bags) begged to be played with. A die cut card goes faster when trying to meet a deadline for me. 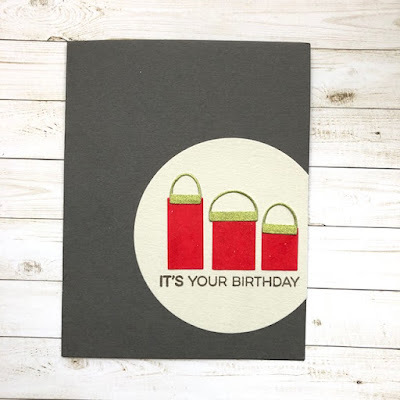 I used red paper washed with red wink of stella, green glitter paper, a light gray circle and a dark gray card base. The sentiment is stamped in smokey gray. 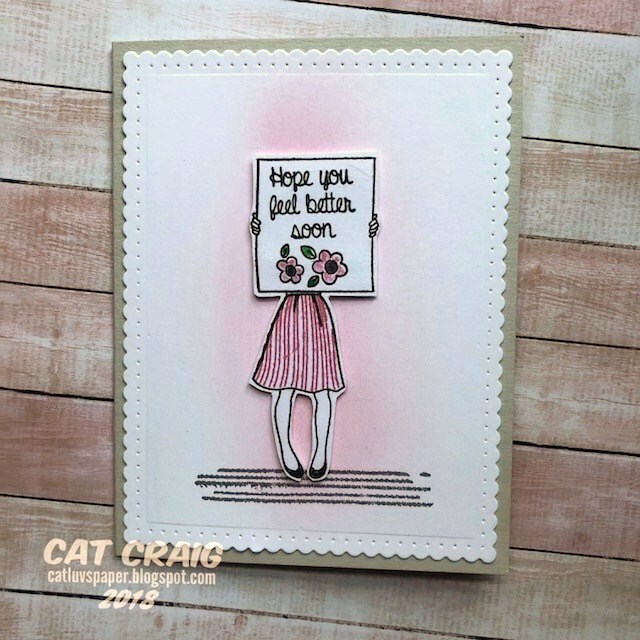 I already posted one card I made with the Hero Arts Dalia stamp and cut set. I made two more recently. 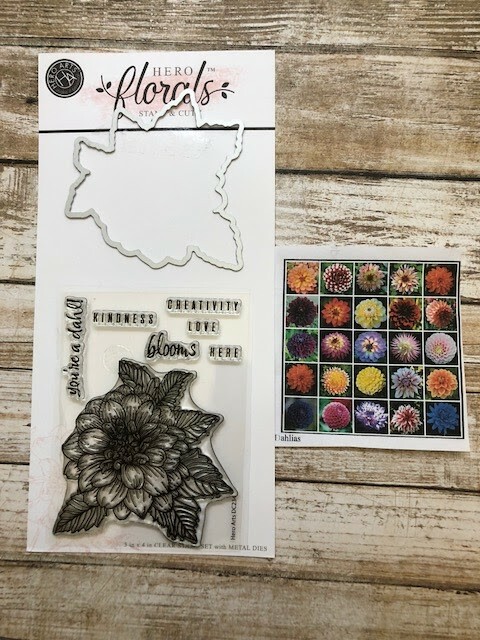 I also wanted to show you what I do when I get in a new flower stamp. I get a google image of the flower. 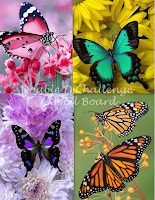 Many times growers have a grid of seed pack flower images that show a variety of colors for that particular flower. I like having that guide - but that doens't mean there will be no more blue flowers - which for some reason I find fascinating. 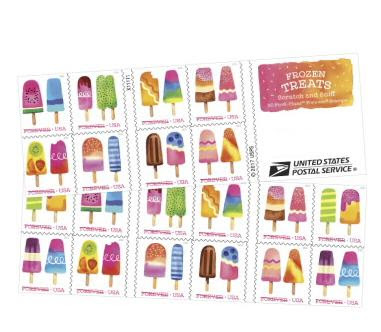 That little snippet is stored along with the stamp and die. I used copics to color, sticking with two color blends as the petals were small. The coral version was plopped on to a card base embossed with a new SU ef. I colored the little dots with a marker to add just a bit more interest to the base - ok yes- all that white freaked me out. The yellow version has nuvo drops added. I love hydrangeas, those beautiful full mop headed blooms are so lush and beautiful. 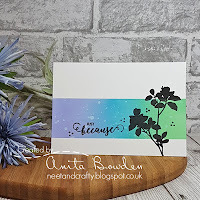 My inspiration for this card came from my recently completed class at Altenew Academy and the hydrangea bushes in front of our home. I used distress oxide inks to water color the stamped mondo hydrangea. I used a combination of salty ocean, faded jeans and wilted violet. Here is a photo of the first blooming of our plants. Today's card is going to be visiting a lot of challenges! The backdrop is watercolored using a ziplock bag and the smooshing technique with Distress Markers. I liked that I could flip it over and move the color around some more. I'll be doing this again. 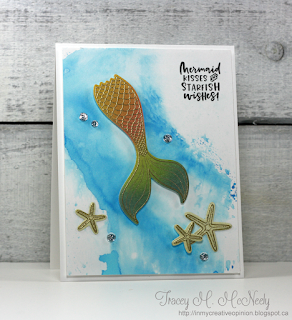 The stamps are Best Fishes from Simon Says Stamp, the die is from Avery Elle. It always bugs me when I miss out on playing with Muse. I woke up this morning and knew I had a couple of hours before the link closed. I pretty much cased Anita's lovely card, but I inverted the black and white. It was an experiment and I wanted to see how those distress oxide inks would work on black cardstock. I thought the colors did well on the black cardstock. Its a bit dramatic, and I have to confess that I like the Muse much better - its cleaner, brighter and more summery. I do not regret testing my idea though! When I saw the challenge graphic at The Card Concept I knew I had to play along. Then life got in the way of my crafty time - but thankfully there is still time to get this in. And while it took some time to get this done, I am also able to enter it to Seize the Birthday Anything Goes - I am adding the toppings of sequins as well. 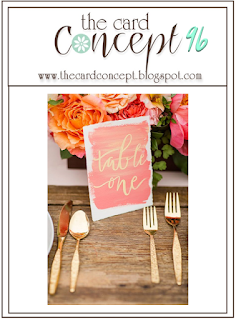 My clean and simple card was inspired by those large blooms, the gold, and the watercolor wash from The Card Concept for the design and colors, and it needed to be a nice girly birthday card with sequins for Seize the Birthday. Both the flower and the sentiment are embossed with gold ep. Thanks for taking the time to pop in! 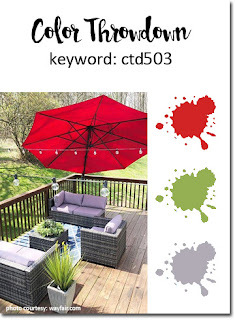 Complementary colors are those opposite one another on the color wheel. I chose blue and orange. A centering ruler helped with placement on this card. Its very simple - which I prefer for sympathy cards. Thanks so much for stopping by and I am happy to post my completion badge. 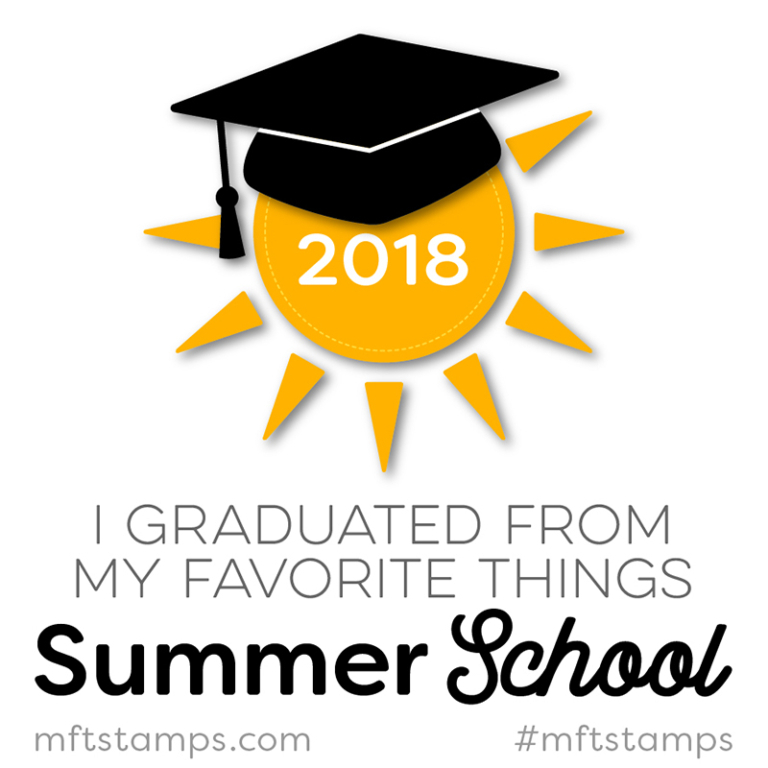 The next lesson for MFT's Summer School is to use primary colors. I love the boldness of traditional primary colors and I enjoyed making this card for my Dad. I cut out the holes with the small peek a boo circle, then colored the spaces with copics. Next I cut out my kitties and stamped them on the cut pieces. I left them black and white so the only colors are primary colors on the card. Now I am caught up with the homework! Samples included words repeated and images repeated. I repeated the sentiment, covered it with vellum found the same sentiment in a smaller font and repeated it on top of my stacked heart embellishment. 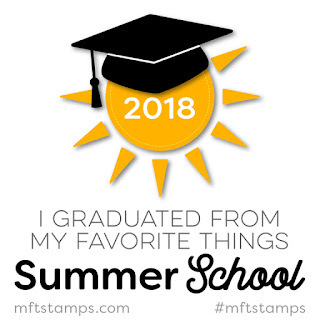 I am playing along at MFT's Summer school this week. Lesson one was about white space - leaving some. 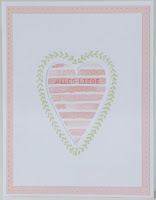 I recently acquired a new embossing folder that adds a subtle linen like texture. Its perfect to give me comforts while still maintaining a lot of "White Space". I really loved the example provided by MFT, which used a very light gray sentiment strip. 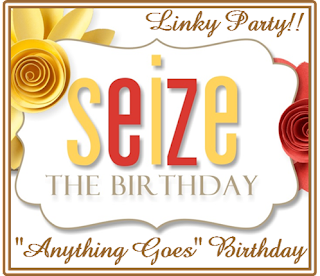 I included that design element on my card. After taking the Altenew class, I found myself at a bit of a low point creativity wise. I think because those classes are so intense for me, I need a bit of a break afterwards. My vampire hours don't help either. 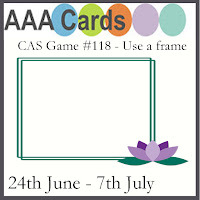 I started with the prompt from Double D Challenges - Butterflies, and then used the sketch from Freshly Made Sketches for the basic design, I added a frame element for AAA Cards as well. My colors were inspired by Muse.